All that glitters is not gold. They can be carnivorous, they can be venomous, and they kill. So think twice before getting attracted to a pretty creature you just saw at the beach. Box jellyfish most visibly differ from the “true” jellyfish in that their umbrellas are cubic, rather than domed or crown-shaped. Box jellyfish can not only move more rapidly than other jellyfish due to their slightly different structure but are also significantly more beautiful as they are almost transparent. You dive and see this magnificent beauty (or even if you don’t see) then don’t dare to touch it because the box jellyfish has been called “the world’s most venomous creature”, though only a few species in the class have been confirmed to be involved in human deaths. It is a sea wasp, the Australian box jellyfish can have up to sixty tentacles, each 15-foot long and with enough venom to kill 60 people. It is a small beautiful 3.1 inch (8 centimeter) aquatic organism exhibiting radiant charm and velvety appearance. The dorsal surface of its cuttlebone is yellowish and evenly convex. The texture throughout is smooth, lacking bumps or pustules making it one of the most beautiful life forms in marine. It occurrs in tropical Indo-Pacific waters off northern Australia and southern New Guinea. Don’t try to cuddle this cuttlefish. Though charming and colorful, this aptly named fish’s displays are meant as a warning. Although they rarely encounter humans, its poison is considered extremely toxic and can be as lethal as the poison of the blue-ringed octopus. This cannot be right. These guys save humans. Every other year or so, some diver or something gets lost out at sea, these guys bring them home. Dolphins have been compared to humans on a number of fronts. They are intelligent, communicate with each other, have the ability to learn, do tricks, play jokes, and can almost use their fins as hands. What’s not to love? Some people even believe they have special healing powers. Swimming with dolphins can be a therapeutic and enlightening experience. It may be their eyes, their smiling face, their playful nature or their intelligence, but dolphins have won their way into our hearts. Dolphins can be violent. Not only have they been known to kill and maim their own young, they also kill porpoises and play with their dead carcass for no apparent reason other than its fun. Male dolphins particularly show aggression towards human males when there’s a female involved. Why? Sexual competition. They may also drown your wife while attempting to steal her away and mate with her. In 2002 CNN reported that an amorous dolphin was targeting swimmers in Weymouth, England. Swimmers were being warned to stay away from the dolphin because “When dolphins get sexually excited, they try to isolate a swimmer, normally female. They do this by circling around the individual and gradually move them away from the beach, boat or crowd of people.” When dolphins get sexually aroused, they become rough. The swimmer may not be able to escape from the 400 lbs animal and drown. And in 1994, a male Bottlenose off the coast of San Paolo, Brazil, that was noted to be fond of female human swimmers attacked a pair of human males that the dolphin apparently considered to be competition and killed one of them. Known as the most venomous fish in the world, the stone fish lives on the bottom of the reefs, camouflaged as a rock. It lives above the Tropic of Capricorn but can be found in the Queensland Great Barrier Reef as well. It’s venom comes from the dorsal area, that is lined with 13 spines, causing shock, paralysis and tissue death depending on the severity of the sting. First aid consists of immobilizing the venom by bandaging the affected area then applying a hot compress. The pain is said to be so excruciating that it lead to amputating the affected limb. Giant King Squid is categorized as the highest mollusks in the kingdom of the invertebrate. Its eyes resemble a human’s eyes. It has 10 arm-like tentacles and when it stretches out its body its length can extend to as long as 65 feet. People always confuse it with an octopus. Unlike Giant King Squid, the octopus only attacks people when it feels a threat from a human. On 25 March, 1941, the British ship immersed into the Atlantic Ocean. 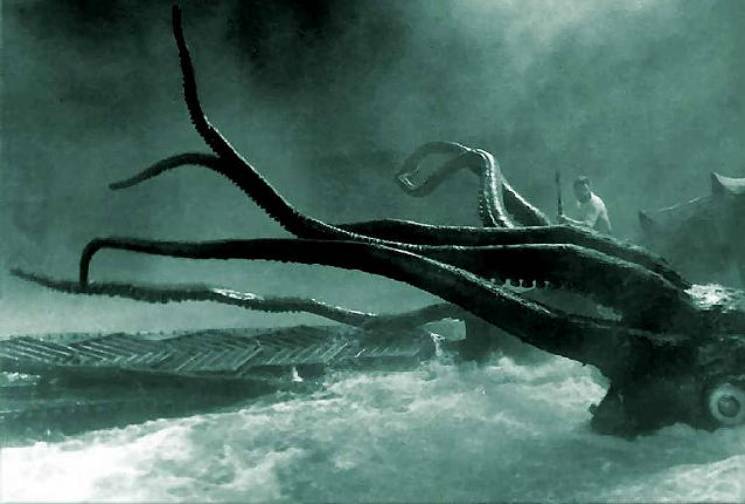 When 10 of the survivors from the ship were about to get caught of one lifeboat, all of a sudden the Giant King Squid emerged to the surface of the ocean. It stretched out its arm-like tentacles to capture two of the survivors’ bodies tightly while triggering them into the bottom of the sea. It was reported that the male Giant King Squid would occasionally eat the female squid after its fertilization.